Save Our Shotguns Apalachicola is a non-profit 501(c)(3) working to preserve the historic structures of Apalachicola for the purpose of affordable housing. We are an all-volunteer organization dedicated to our mission to preserve historic structures, to create low and moderate income housing, and to provide training and jobs for local residents. old houses that adorn our community. They need to be brought back to life." incentive for Apalachicola to build affordable, attractive housing." a win-win situation for all of Apalachicola's citizens." The American dream of home ownership is closer to reality for Florida Fish and Wildlife employee Kelly Williams. Last Friday, March 29, the 30 year-old biologist won the lottery for the opportunity to buy a brand new two-bedroom house in Apalachicola. 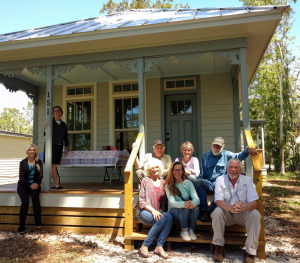 The reproduction shotgun at 151 Willie Speed Boulevard was built by Save Our Shotguns Apalachicola Inc, a non-profit 501(c)(3) dedicated to creating affordable energy-efficient housing and preserving the city’s historic structures. The house, appraised at $178,000, will be sold at cost for $125,000. To qualify, applicants had to earn less than $50,000, have lived or worked in Apalachicola for at least a year, not currently own a house, and pre-qualify for a mortgage. Three people pre-qualified and were entered in the drawing. Kelly’s name was picked out of a basket by Apalachicola resident Allen Jones, who helped finance the project, along with a myriad of donations from friends and supporters. Pictured after the drawing from left to right: Melanie Williams of People’s South Bank, Attorney Barbara Sanders, Save Our Shotguns members Holly Brown and Peter Gallant, house lottery winner Kelly Williams, Save Our Shotguns members Pam Richardson and Creighton Brown, and Allen Jones. Send us your email address for more information. Click here to watch the WJHG-TV report on Save Our Shotguns. Click here to read the New York Times article about Save Our Shotguns. The SOS house, at 151 Willie Speed Boulevard (13th Street), whose dimensions were taken from a historic shotgun currently under reconstruction on the corner of Avenue M and 7th Street, features two bedrooms, a front porch, and iconic characteristics such as rooms one behind the other, long front windows, gingerbread trim and decorative columns. Glen Coxwell of Construct Group S. E., Inc is the contractor. Save Our Shotguns Apalachicola Inc. (SOS) is a 501(c)3 all-volunteer, non-profit organization dedicated to historic preservation and reproduction. Our mission is to create affordable energy-efficient housing for current low-to moderate-income residents of Franklin County and to provide apprenticeship opportunities for local residents. Throughout the 2017 and 2018 PEARLS celebrations of the cultural significance of shotgun houses, the community generously provided SOS with funds and a line of credit which will enable completion of this first project. than-60’x100’ lot. This change will not increase density. Shotgun houses were Apalachicola’s original affordable housing and the cultural backbone of the Hill. Our intent is to renew or reproduce these structures. The 8th Street four-house restoration could serve as a test case. If successful, it could be the key to enabling more restoration on the Hill. and two fine examples of shotguns on Avenue M (Block 175, Lot 6) are slated for destruction. Street shotguns will meet a similar fate. money or lines of credit to further the mission. Want to take a walking tour of Apalachicola's historic Hill community? Save Our Shotguns has partnered with the Florida Humanities Council to create an audio tour with visuals you can simply download on your phone. Florida Stories, a statewide effort of the Florida Humanities Council, supports the creation of cultural, historical, and architectural walking tours for communities across the state of Florida. The Florida Stories app allows users to learn about the history of some of Florida’s most unique towns at their own pace and on their own schedule. How to use the Florida Stories App on your phone? It's simple! Download the Florida Stories App by clicking on one of the buttons below, either for Apple IOS or Android mobile devices. The following instructions are for Android phones; the Apple IOS is probably similar. 4. When downloading has finished, a menu will come up. Click on "Tours"
5. Another menu will come up; click on "The Hill, Apalachicola"
6. Read the Introduction; at the end, you'll see another menu with the 12 different listed "stops." You can start at any stop. 7. At the end of each stop, click on "Take Me to the Next Stop" (this gives directions) and then, below the map, click on "I'm Here."